Education Secretary Betsy DeVos is proposing new rules to the Borrower Defense program. If you attended a school that misled you or engaged in misconduct, there's a government program called Borrower Defense to Repayment that helps get relief from your federal student loans. The rules that explain this program were introduced in 2016, after a number of high-profile cases involving some for-profit colleges. "Basically, any students could raise their hand and qualify for free money," says Mary Clare Amselem, a policy analyst from the conservative Heritage Foundation. When colleges misbehave and students get those loans forgiven, she explains, taxpayers are on the hook for the bill. "Shrinking the budget that goes towards Borrower Defense is definitely a good thing for American taxpayers." The biggest change in DeVos' rewrite of the rules: Students who want their debt forgiven will have to show that schools had the intent to harm them, with misleading advertising, a reckless disregard for the truth or financial harm. "It puts so much responsibility on students and students alone," said Ashley Harrington, a lawyer at the Center for Responsible Lending, "and on no other piece of this puzzle." "This new version reads like a road map for how for-profits can continue to behave badly and avoid accountability," Harrington says. For-profit schools aren't the enemy, insists Linda Rawles, a lawyer based in Arizona who helps mostly for-profit schools comply with federal regulations. 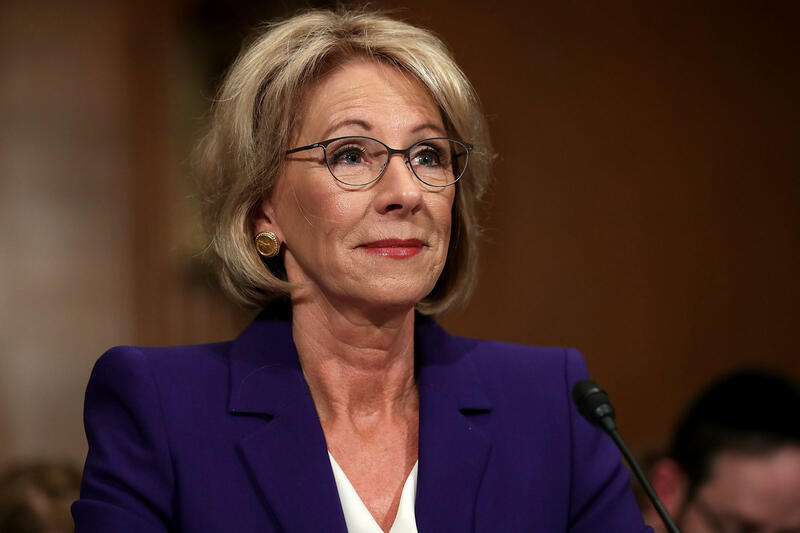 She was at that negotiating table, too and supports DeVos' proposal. "I don't think it lets the schools off the hook at all," she says, "If they commit fraud, then this has teeth." In a statement, Secretary DeVos agrees: "Our commitment and our focus has been and remains on protecting students from fraud." And she says, the new regulations will spell out clear rules for that. It could become harder for students who were victims of fraud to get rid of their debt. That's because of new rules proposed by the Trump administration. It says the change will save taxpayers from the responsibility of billions of dollars of student loans. NPR's Elissa Nadworny reports. ELISSA NADWORNY, BYLINE: If you attended a school that misled you or engaged in misconduct, there is a government program that helps get relief from your federal student loans. It's called the Borrower's Defense to Repayment. The rules that explain this program were introduced by the Obama administration in 2016 after a number of high-profile fraud cases involving some for-profit colleges. But Education secretary Betsy DeVos and other critics felt the Obama-era regulations were too broad. MARY CLARE AMSELEM: Basically any student could raise their hand and qualify for free money. NADWORNY: That's Mary Clare Amselem from the conservative-leaning Heritage Foundation. Plus, she says, there's the money aspect. When colleges misbehave, taxpayers are on the hook for that student loan money - an estimated $14.9 billion over the next decade, according to the Education Department. AMSELEM: Shrinking the budget that goes towards Borrower's Defense is definitely a good thing for American taxpayers. NADWORNY: The biggest change in the DeVos rewrite of the rules? A higher burden of proof on students. Individuals must prove their college's deception was intentional, showed a reckless disregard for the truth or resulted in financial harm if they want their loans canceled. And that's a high bar for students, says Ashley Harrington, a lawyer at the Center for Responsible Lending. ASHLEY HARRINGTON: It puts so much responsibility on students and students alone and on no other piece of this puzzle. NADWORNY: Harrington was involved in the negotiations of this new rule. And she says, in that negotiation process, she witnessed for-profit lawyers make a number of suggestions, many of which appear in the new rules. HARRINGTON: This new version reads like a roadmap for how for-profits can continue to behave badly and avoid accountability. NADWORNY: In a statement, Secretary DeVos disagrees. Our commitment and our focus, she says, is on protecting students from fraud. And she says the new regulations will spell out clear rules for that. Student advocacy groups worry those clear rules could be so strict few students would qualify. The changes are open to public comment for 30 days. One big question the department is asking - should relief be limited to students in default, or should folks actively repaying their loans get help too? Elissa Nadworny, NPR News. (SOUNDBITE OF TORO Y MOI'S "SAY THAT") Transcript provided by NPR, Copyright NPR.